A Bihu workshop for children underway in Guwahati. Hundreds of children are seen gathering at Shilpgram in the city for the past few days for this dance workshop for children. School going children and young girls dressed in traditional attire are reacquainting themselves with their Assamese roots through this workshop where experts and artists pass on to them the intricacies of Bihu dance. The workshop is being conducted by noted Bihu artistes under the supervision of research scholars and musicologists like Somnath Bora, Dr. Prassanna Gogoi and others. The onset of springtime is undoubtedly the most preferred time to visit Northeast India. For this is the time when the people of the region, belonging to different tribes and races and with myriad ethno-cultural traditions, languages and religious beliefs, give full lease to their joy and exuberance in the form of unbridled festivities celebrating the mood of nature. While folk dancers from as many as 14 States of the country shared space with handloom and handicraft artisans, puppeteers, writers, poets, intellectuals, choral singers, theatre groups, food connoisseurs, the highlight of the five-day extravaganza would undoubtedly be the participation of folk dancers from the neighbouring country of Myanmar who were sponsored by the Indian Council for Cultural Relations. In a unique spectacle of colours marked by graceful movements and quaint rustic charm, the Burmese dance troupe performed as part of a unique folk fusion dance presentation on March 16 and the same was choreographed by internationally acclaimed musicologist Dr. Prassana Gogoi. A master craftsman who has earned acclaim in a number of countries, Dr. Gogoi’s accolade list also includes medals in the Seoul Drum Festival of South Korea. The beautifully choreographed presentation depicted the confluence of varied cultures in a truly vibrant and synchronised fashion. 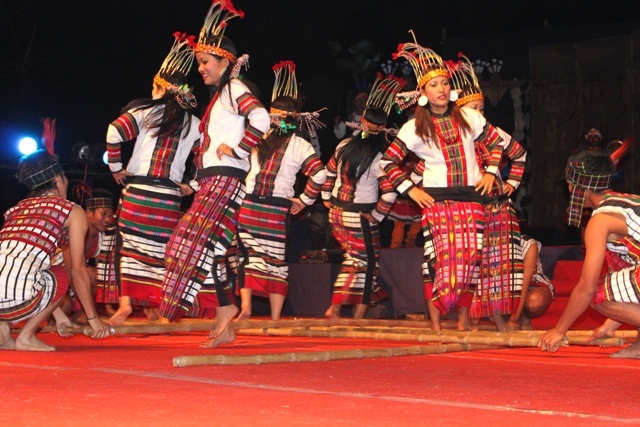 The folk dance presentation featured regional folk dance forms like Rikhampada of the Nishi community of Arunachal Pradesh, Bagrumba of the Bodo community of Assam, Cheraw dance of Mizoram, Ka Shad Mastieh of the Khasis of Meghalaya, amongst others, as well as dance troupes from seven other States of the country. The visiting dance troupes included performances of the Gussadi dance of Andhra Pradesh, Gaur Maria dance of Chattisgarh, Dandiya Raas of Gujarat, Kullu Nati of Himachal Pradesh, Sambalpuri dance of Orisssa and Choliya dance of Uttaranchal. The folk dance troupes also performed in Mokokchung on March 12, Jaluki in Peren district on March 18 and Medziphema on March 19 as part of the NEZCC’s outreach programme. The North East Spring Festival 2011 also had something in store for book lovers, students and the people of Dimapur in the form of the Dimapur Book fair. Organized by the National Book Trust in close collaboration with NEZCC and the district administration of Dimapur, the fair was participated by as many as 26 publishing houses which had come from different parts of the country. Marked by well-attended panel discussions, seminars, workshops, poets and writers meets and competitions for children, the book fair was regarded to be a major step in the development of the reading culture of the people of Dimapur. The fair, which continued for five days, was inaugurated by eminent litterateur Prof Temsula Ao and Dimapur Deputy Commissioner Maowati Aiyer. Moving on to the performing arts festival, while puppeteers from Rajasthan enthralled the students and children who had come to the fair Guwahati-based theatre group Stage Fusion also performed two of their acclaimed comedies, including their latest ‘Date at 8’. Directed by Rupa Hazarika Som, the Guwahati-based group has been able to earn much acclaim over the last couple of years. 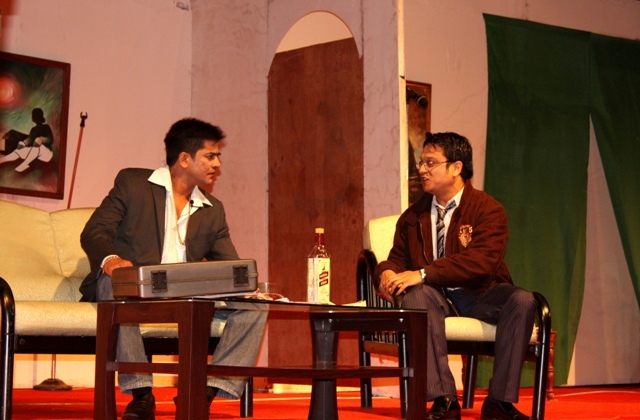 Date at 8 had been staged for the first time in Guwahati earlier this year. With the showcasing of varied art and cultural forms for almost a week, the North East spring fest drew to a close on March 20 with a fusion music evening. 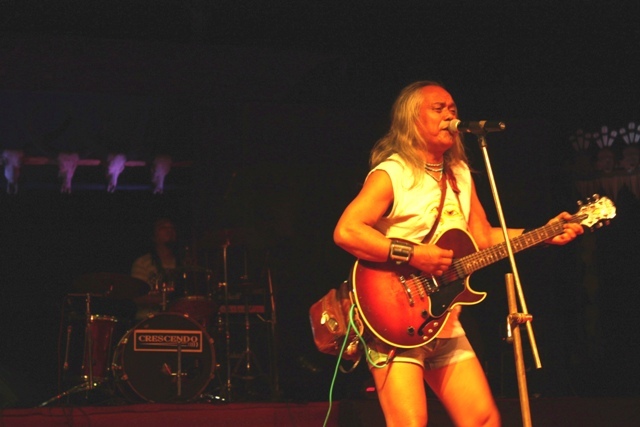 While Khasi guitarist-singer Lou Majaw and his group of friends was the biggest draw, the Naga choir led by Lipokmar Tzudir and the Llanfair Chamber Choir from Mizoram truly took the evening took its highest crescendo. All in all the North East Spring Fest 2011 proved to be a gala success, truly reflecting the joy, exuberance and optimism of spring time. 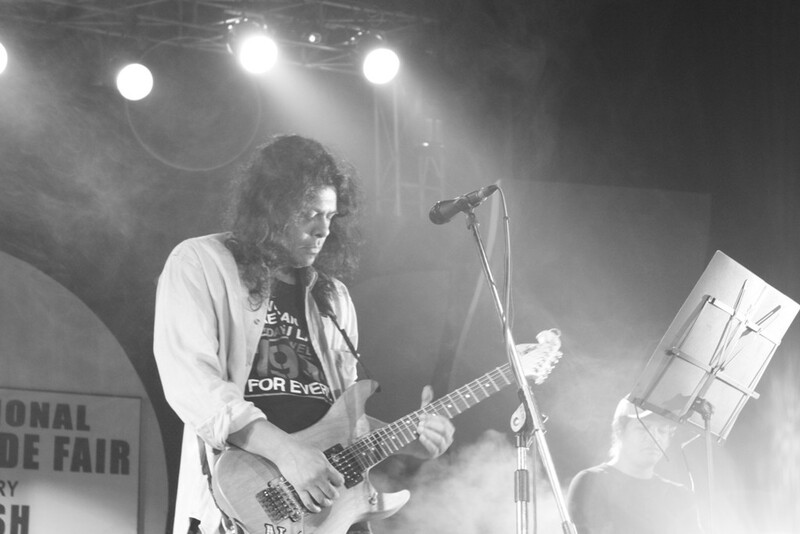 Guwahatians, who are generally fed on a heavy staple of rock and metal, recently got the chance to enjoy some serious music. 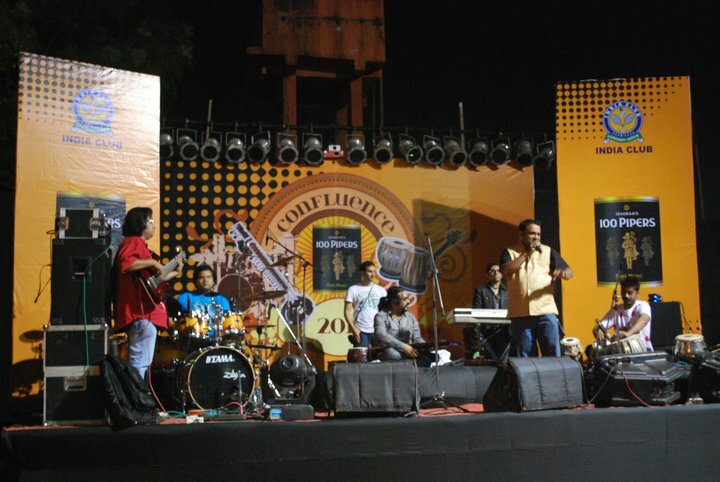 I am talking about Confluence 2011 – a much hyped musical event which had four legends assembling together on the same stage. 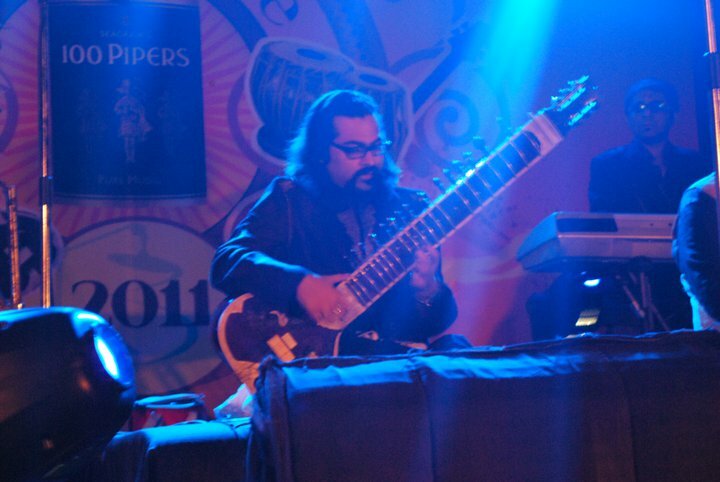 Organized by India club, the concert featured legendary tablist Talvin Singh, percussionist Gino Banks, Sitarist Purabyan Chatterjee and Raghab Chatterjee. 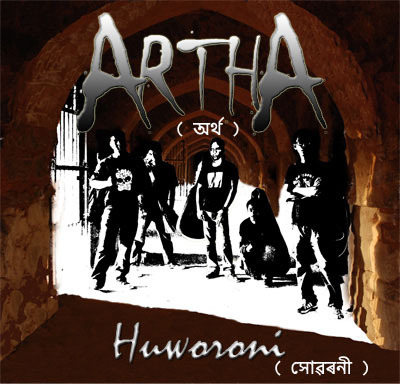 I recently got my hands on Huworoni – the debut offering of Assamese rock band Artha. 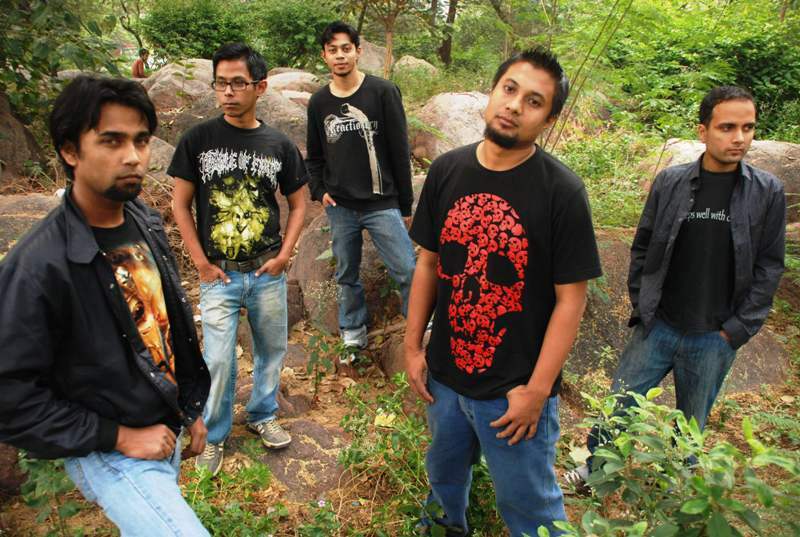 Made up of talented musicians from the State, Artha is a multi-genre outfit based in the capital. 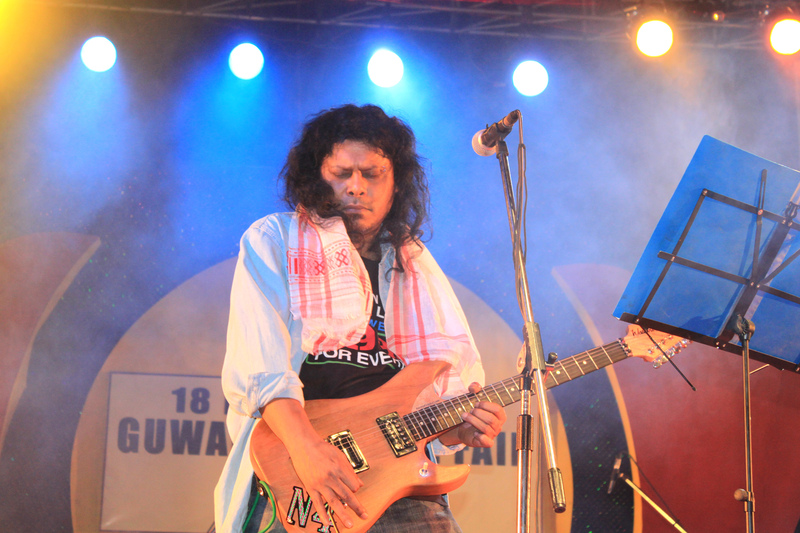 Huworoni was released earlier this year at Gauri Sadan in Guwahati by veteran guitarist Utpal Barsaikia along with a host of other guests. 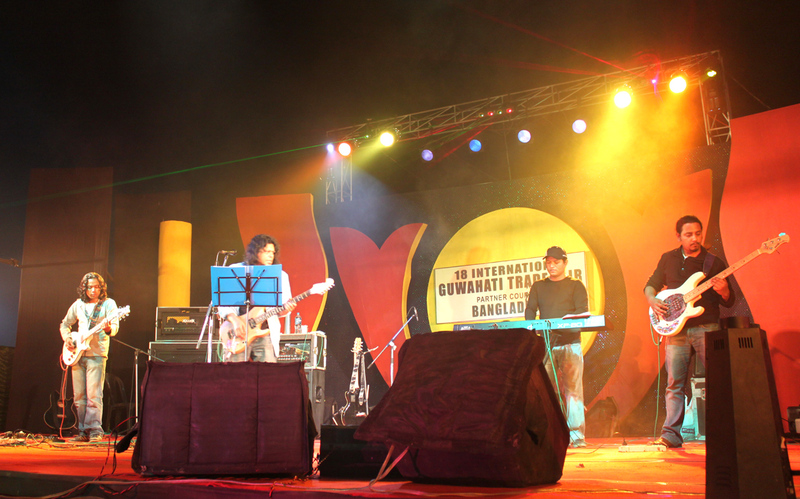 Artha comprises of Rahul Buragohain (vocals and rhythm), Shivaji Bora (bass), Pranjal Gogoi (lead), Fredi Roy (rhythm and keyboard) and Prashanta Talukdar on drums. Based on contemporary themes, most of their compositions and lyrics would appeal to the present-day youth, especially those living outside the State. Huworoni – the title track of their debut album is a case in point. Drawing on strong emotive lyrics, the song dwells on the longing of people who live outside their native place for their homelands. The album begins with the track Hontrakhbadir Kahini which dwells on the realization of a terrorist of his mistakes and his desire to return back to lead a normal life. The title track, Huworoni, which is divided into two parts follows up next. The other compositions are all based on contemporary themes like love, longing and frustration which I am sure would find a lot of takers amongst the younger lot. Jodi Xodai, for instance, dwells on the feeling of frustration which besieges people at periodic intervals, while Loi Juwa and Najanu Kiyo are both love songs. Based on melodic tunes, what attracted me the most about the majority of the tracks was the smart acoustic manoeuvring that is a predominant feature in the entire album. 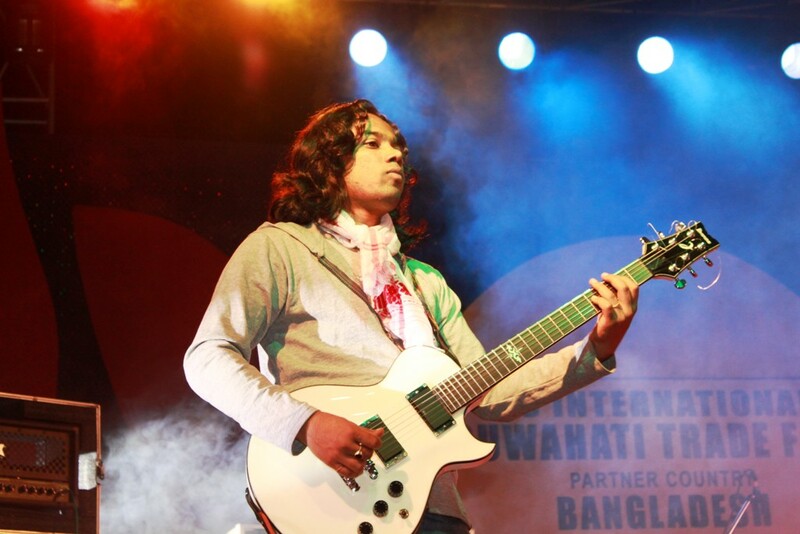 All the tracks in the album have been written and composed by Artha along with Arunjyoti Gohain and Rishi. While four songs were recorded in The Quivers Studio in Dibrugarh, the other four were recorded in the Noisegate studio in Guwahati. The songs have been edited and mixed by Arunjyoti Gohain in Quivers studio, Dibrugarh. The results for online Indian music business consultants Musicbizbro’s online contest for artists and bands which ran through the months of September and October were declared recently. Melbourne-born singer, songwriter, pianist Jessie Sparks was adjudged the winner of the Artist/Band contest, while the runners-up are Mayuresh Kelkar (India) and Jackson Church (USA). The winner of the lyric writing contest is Jamie Meyer (Sweden) while the runner up is Sal Belloise (USA). Jessie, who had released her debut Indie album in 2007, had been a serious contender and with her seductive and intelligent music, she is all set to make a mark in the global arena. The songs under Artist & Band contest were judged on its vocal performance, song selection, originality, uniqueness and artistic merit. The lyrics writer contest were judged on its song structure, composition of melody and harmony, scansion (rhythm/meter) and content of the song. Photographs @ Aiyushman Dutta, February 2011. Permission required before reproduction in any format. Northeast India is known for its geological marvels, nature’s splendor and an unparalleled spectrum of ethno-cultural multiplicity. A multitude of tribes and races with myriad ethno-cultural traditions, languages and religious beliefs live here side by side keeping alive their traditions, institutions, languages and religious practices. A fine texture of diverse hues spraypainted on a beautiful landscape makes this melting pot of human races a true ethnological wonder, perhaps the only one of its kind in the whole world. 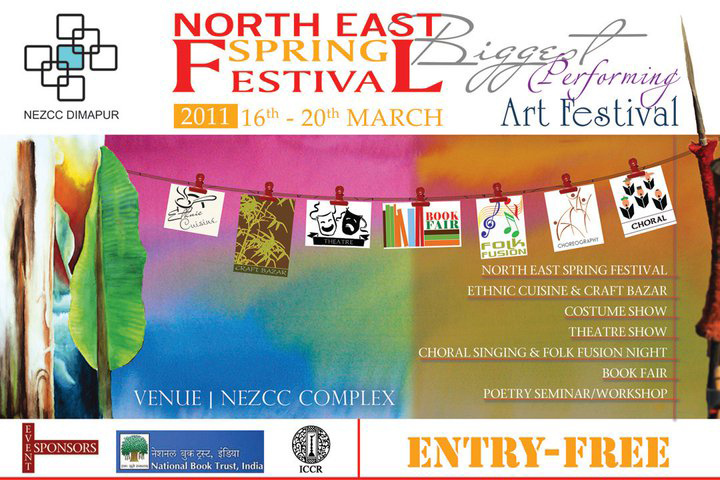 This March, the varied flavours of the Northeast are all set to erupt in the form of the North East Spring Festival 2011 – a mega Northeast-centric carnival capturing the mood and brilliance of springtime. With more than 500 artistes participating, the festival will showcase the biggest ensemble of folk dances, folk music, puppeteers, craftsmen, poets, choral singers, theatre groups, chefs and others who will showcase the best of regional dance, music, handloom and handicraft products, cuisine, et al. Organized by North East Zone Cultural Centre (NEZCC), the festival will be held from March 16 to 20 in the NEZCC grounds, Dimapur. While the festival also has a lot for music lovers in the form of choral and fusion music concerts featuring stalwarts like Khasi guitarist-singer Lou Majaw, a major highlight of the fest will be the performance of cultural troupes from Myanmar and Cambodia. 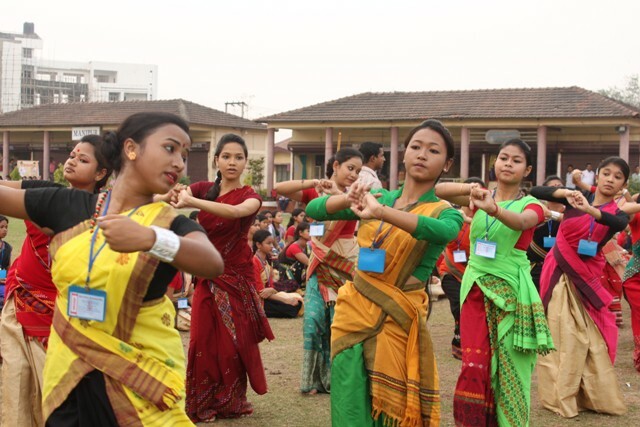 Sponsored by the Indian Council for Cultural Relations (ICCR) under the Ministry of External Affairs, the international dance troupes will also perform in Lumami and Mokokchung as part of the NEZCC’s outreach programme. Cultural troupes from other Zonal Cultural Centres of the country will also perform in Diphu, Karbi Anglong of Assam and Medziphema of Nagaland. And if you thought that was all, you better think again. Not just song and dance, the North East Spring festival also has something for book lovers in the form of a Northeast Book Fair organized by NEZCC in association with the National Book Trust. 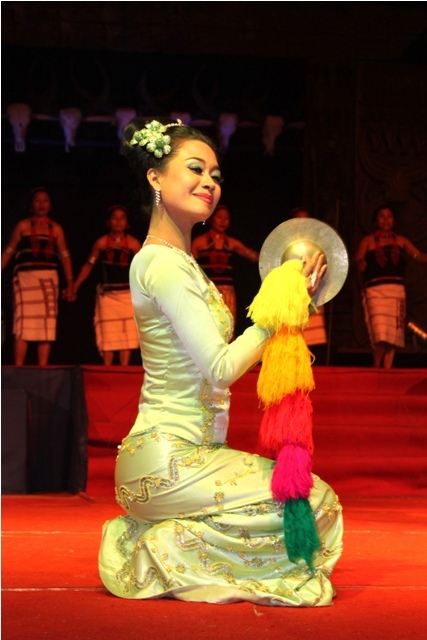 The following dance performances from the Northeast would be featured in the spring festival: Domik Tsheri (Arunachal Pradesh), Bagromba (Assam), Thangta, Dhol and Pong Cholom (Manipur), Cheraw (Mizoram), Maroni dance (Sikkim), Lebong Bomani (Tripura), Archery, Shad Reit and Shad Weit dances (Meghalaya). From other parts of the country, one will get to watch performances like Sambalpuri dance of Orissa, Thodla Choufla of Uttarakhand, Kullu Nati of Himachal Pradesh, Gaur Maria of Chattisgarh, Gussadi of Andhra Pradesh and Dandia Ras Garbha of Gujarat. 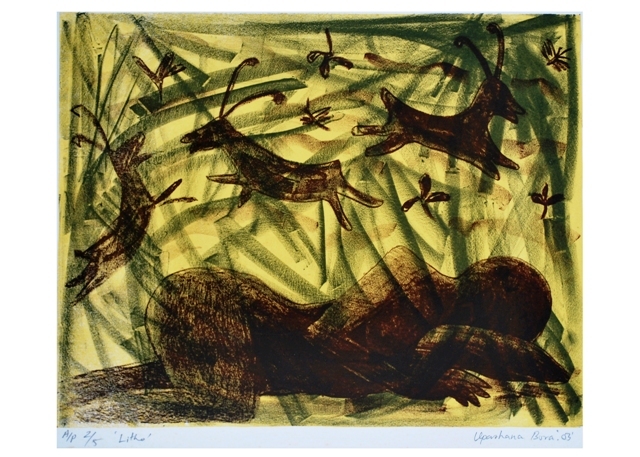 Nature in its varied aspects is the predominant aspect in the works of artist Upasana Bora, whose debut solo art exhibition got underway in the State Art Gallery last week. A familiar face in the art fraternity of the State, having participated in a number of workshops and group exhibitions, this was her first solo art exhibition. 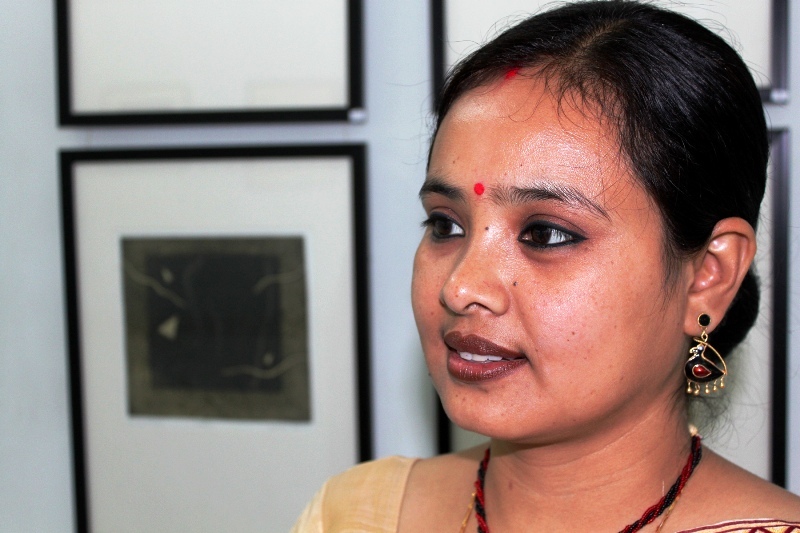 The exhibition was inaugurated by noted singer Sudakshina Sharma. A post-graduate degree holder in graphic arts from Vishwa Bharati University Kala Bhavana Shantineketan in West Bengal, Upasana’s debut solo exhibition has around 42 of her artworks being displayed. “The artworks exhibited have been done over a period of eight years. I started working on graphic arts since I the time I joined the Government College of Arts and Crafts in 2008 for my graduations,” says the artist.